Mondesi's House: What's the Value of a Troy Polamalu Re-tweet? What's the Value of a Troy Polamalu Re-tweet? 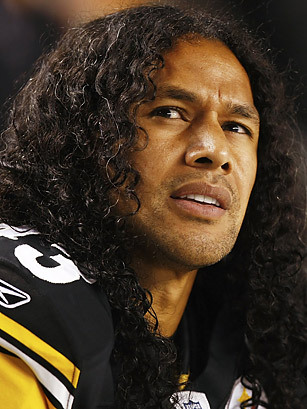 A number of celebrities have agreed to use their Twitter accounts as vehicles for fundraising, and Troy Polamalu has joined the action. Several auctions currently running on eBay offer the opportunity to have Polamalu follow you on Twitter for a minimum of 90 days, retweet one of your tweets and send out a tweet including your @twitterhandle. This listing is at $1,075 at the moment, with two days remaining in the auction. The "Mega package" also includes two tickets to a Steelers home game (seat location TBD) and an autographed jersey. Three other listings without the extras currently range between $132-$203 at the time of posting. 100% of the sale price from the Polamalu auctions will benefit the organization A Home in Haiti. While the prices seem high, they've got a very long way to go to catch some of the most expensive celebrity Twitter experiences. MMA maven Dana White's package is at $15,600 and counting, followed by Zachary Levi of Chuck ($14,900) and actress Jewel Staite ($8,200).There are more than 350 different packages available at the moment.